Mummy Ate Me: Kitchen renovations ... please help! Kitchen renovations ... please help! bahahahahaha - in my dreams! We are going to renovate our kitchen. I'm already over it and we have only just started getting quotes. The whole project will involve moving several walls and will no doubt be incredibly painful and take twice as long as the builder promises. I want to make sure that the end result - a sparkling new kitchen - is as good as it can be. And I'm hoping that all of your will be able to help. I want to know what is the best and worst thing about your kitchen. What do you curse every single day? 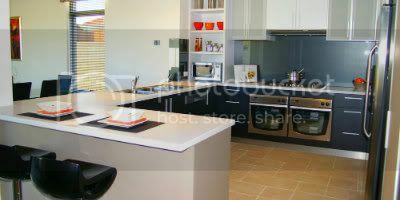 If you have renovated your kitchen what did you get right and what mistakes did you make? There isn't a right or wrong answer here - our current kitchen has less than 130cm of bench space so anything will be better than that - I just want to get as much advice as possible about what makes a great kitchen. What is the best and worst thing about your kitchen? Drawers are dearer but I think its a false economy to scimp on them. Tupperware does much better in drawers. I love my tupperware drawer but sacrificed a pot drawer to get it. My kitchen is too small so too people can't be in it at the same time and no bench space. I turned my pantry into the crockery cupboard. Everything stacks nicely. My pantry stuff is in small high cupboards and would prefer a real pantry for them but the stuff doesn't get hidden in the back. My mum has an old fashioned walk in pantry its fantastic! I really really want a walk in pantry - I picture it half empty but I'm sure it would be overflowing really soon. Good idea about the drawers - I hate the way tupperware gets lost at the back of the cupboard! Narrow cupboard next to the range hood is genius!!! Thanks. You did give me the kitchen lady's number and a couple of other contacts too - thanks.